Moose Jaw has been privileged in a special way. In a partnership between Prairie South School Division and the MJ Museum and Art Gallery, Moose Jaw was one of the first places in the country to host the exhibit “100 Years of Loss”, an exposition of the history and legacy of the Indian Residential Schools in Canada. Most recently, Moose Jaw was one of four cities in Canada chosen to coordinate Project of Heart, a second venture related to residential schools. The other locations were Vancouver, Winnipeg and Ottawa. In Saskatchewan, Project of Heart is about tiles and a drum. A First Nations drum was built by Jeff Cappo from the Lone Creek Drum Group. In the first phase of the project, students throughout the province were invited to decorate tiles to place on this drum. The tiles commemorate the children who died in the residential system. The tiled drum was unveiled at a Powwow in Moose Jaw on June 5th. 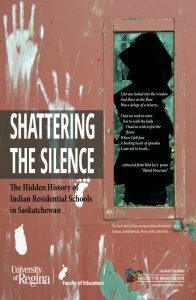 Indian Residential Schools operated across the country from 1890 to 1996.